Sporty and energetic � or reliable travelling companion? 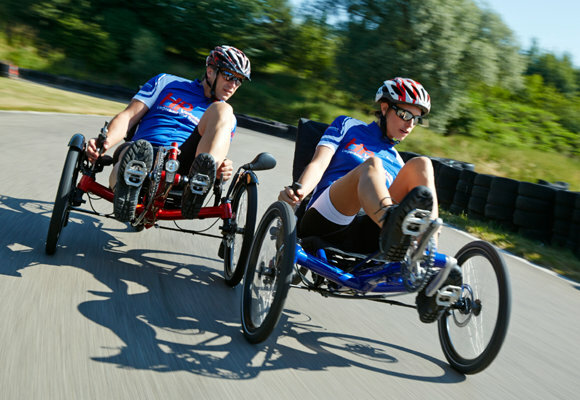 You can choose: The Gekko fx 26 is just as versatile as all the vehicles from our recumbent manufactory in Kriftel. 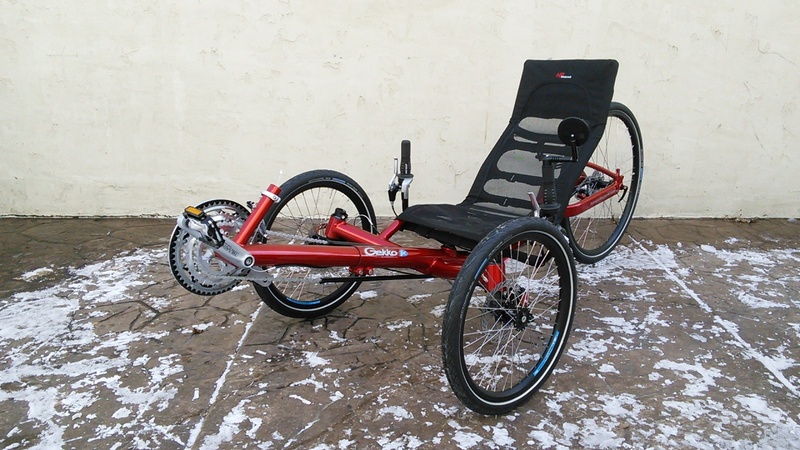 Whether puristic for highspeed-manouvres or equiped with fenders, rack and our special comfort options: You have got the choice � and we will built up the trike you desire! 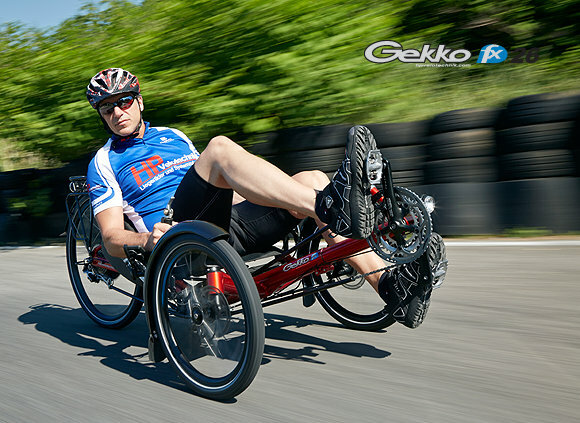 The large 26 inch rear wheel provides the Gekko fx 26 with the crucial Plus of dynamic propulsion. The advantages are clear: with the slender drive section behind the cockpit comfortable driving characteristics increase perceptibly. Key points are smooth running, less rolling resistance and easy rolling over obstacles. Impressive: the elegant notchback. 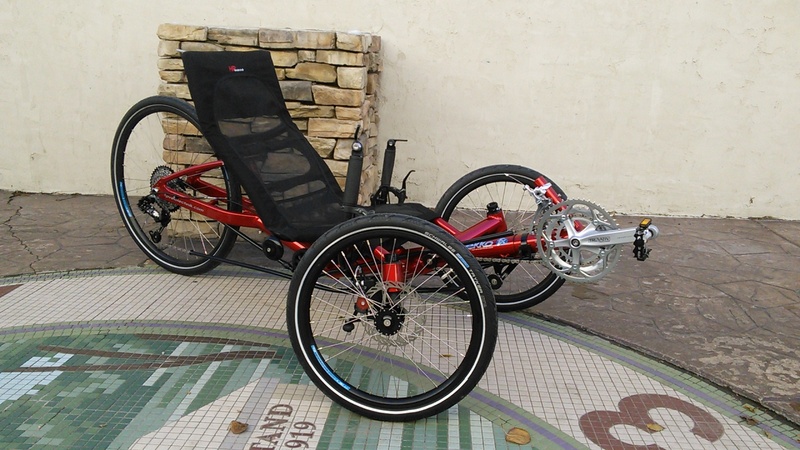 The powerful, curved seat stay appears to transfer the power directly into the pilots seat of your trike. The long wheelbase in combination with the dynamically swept forward cross members give the large Gekko fx 26 it's own prominent language of design. 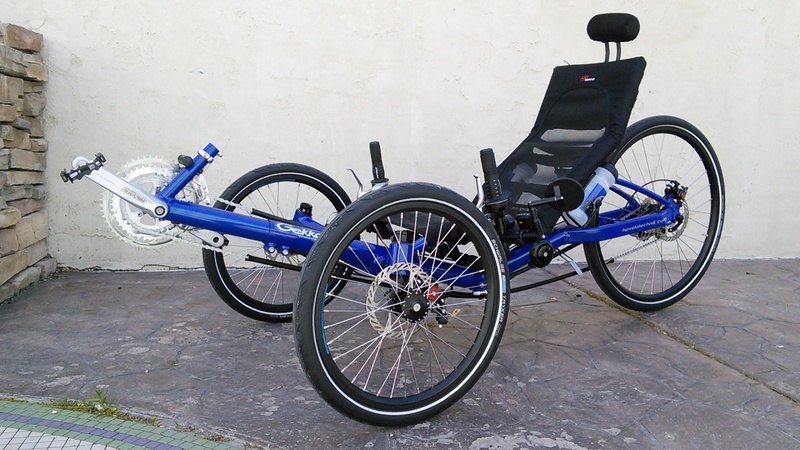 The compact, smooth-running wheels are optimized for the high side forces on the tricycle. The black anodized HP Velotechnik tricycle rims with rugged aero hollow section combine excellent directional stability, maximum lateral stiffness and low weight for quick acceleration. Wide, highly resilient tires with puncture protection. Further details are the hubs by HP Velotechnik with maintenance-free, sealed precision ball bearings and the rust-proof stainless steel spokes. Wider is better: The wider the track width, the higher is the tilt stability and the faster your trike is when cornering. 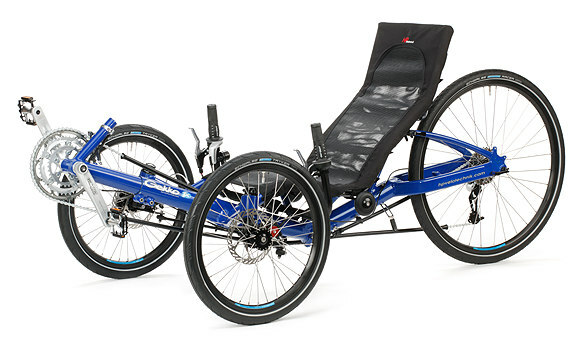 For this purpose the broad track of 78 cm (30 3/4") of the Gekko provides a lot of room between the wheels for your hands on the wide handlebars, allowing much wider steering angle for a small turning circle of just 4.25 m (167"). 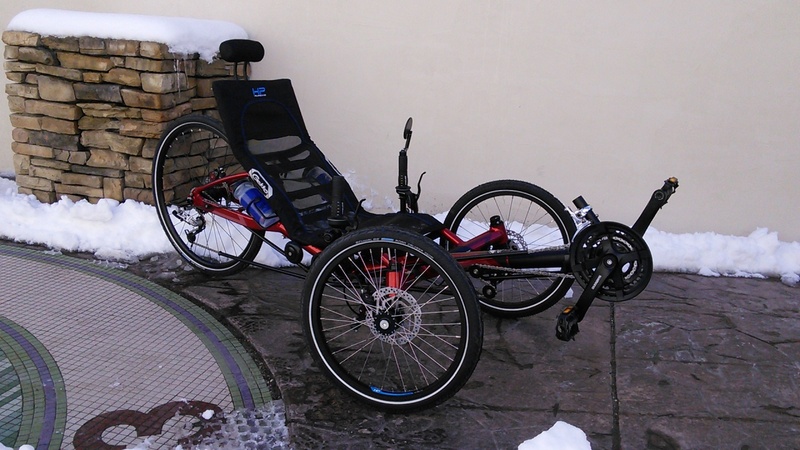 To enable your trike to slip casually through doors and gates, HP Velotechnik has developed narrow hubs for a low total width of only 83 cm (32 3/4"). In spite the inclination towards larger things the Gekko fx 26 can make itself small, just like it's kid brother with the 20 inch rear wheel. In no time at all. 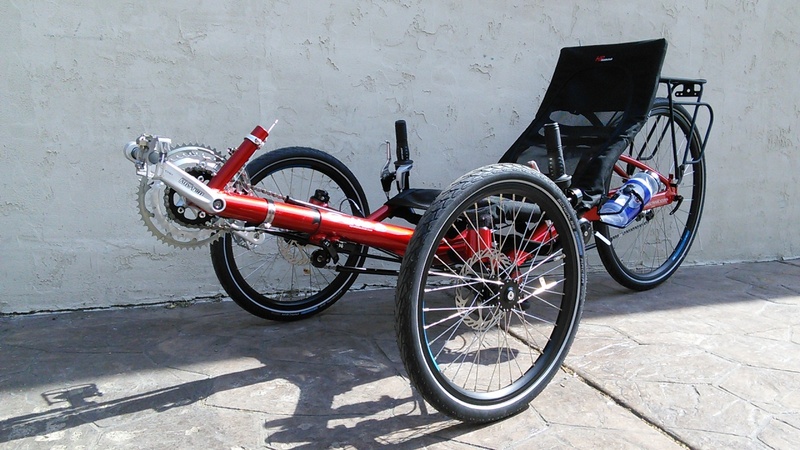 A practiced trike rider will take only 10 seconds to fold his vehicle to a size of 107 � 83 � 58 cm (42" � 33" � 23"). Thanks to the patented HP Velotechnik Dual Flat Fold System no parts have to be dismantled. Not even with the optional electric motor and battery. Double safety: The sturdy folding joint has a safety bolt that is unlocked against spring pressure after the quick release is disengaged. 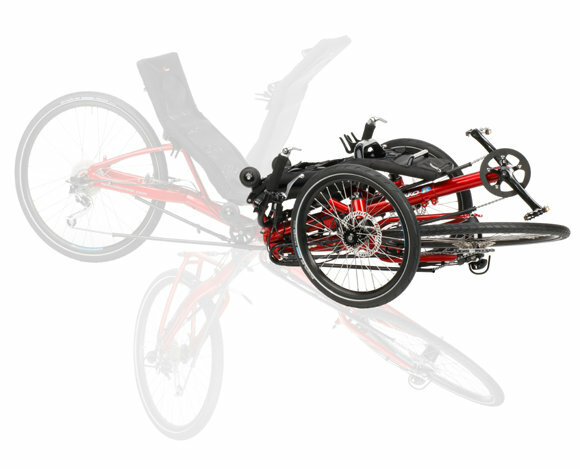 The stainless steel precision folding axis was exclusively designed by HP Velotechnik. Practical during transport: HP Velotechnik has developed unique open knuckles: The front wheels can be removed easily along with the brake discs by loosening a single screw (standard equipment). 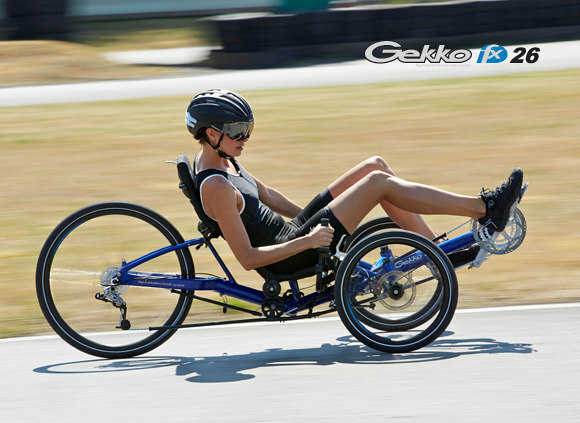 With the pedal positioned significantly higher than the seat, an efficient power transmission is facilitated and alongside the optionally adjustable reclined seating position underscores the sporty nature of your Gekko. 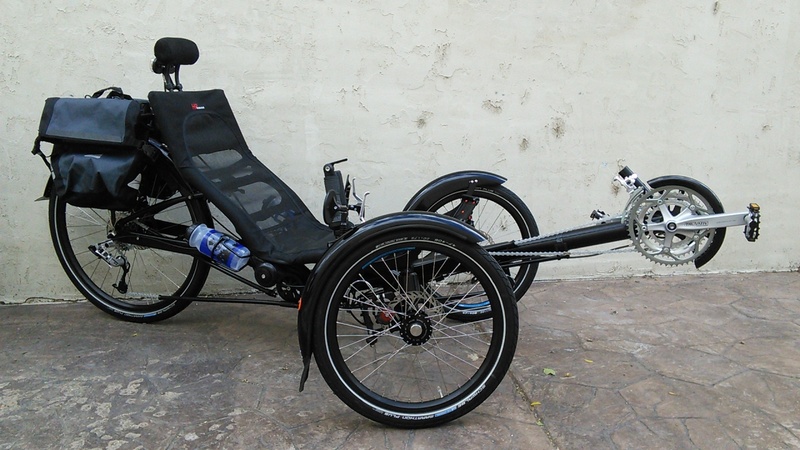 The comfortable ergo handlebars under the seat are built to relieve your wrists and neck muscles. HP Velotechnik's tried and tested steering geometry combines smooth directional stability with impressive maneuverability. Solid bearing with adjustable cartridge headset on the handlebar and maintenance-free sealed joint heads on the tie rods. The lightweight, high strength knuckles are forged and CNC machined for maximum tracking stability. They are mounted with durable, adjustable headsets rather outside on the frame. 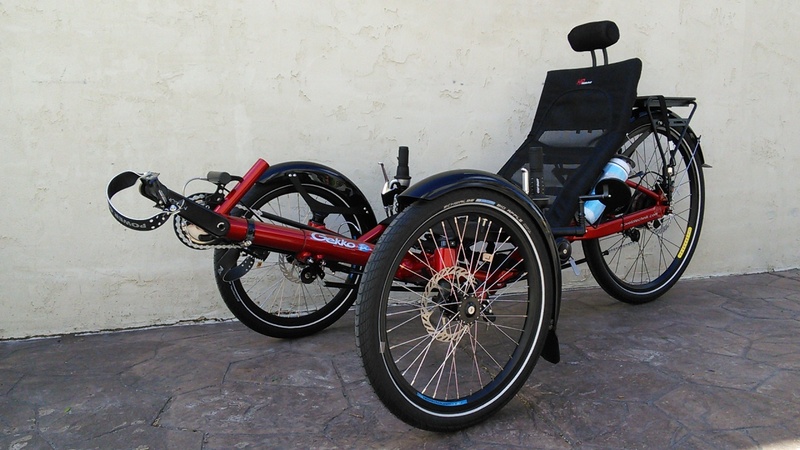 The HP Velotechnik seat system creates an exemplary ergonomic connection at the main interface between the rider and the trike. The well-ventilated mesh seat of the Gekko is integrated in the frame structure for maximum stability. The seat features an anatomically shaped, adjustable reclining backrest and a handy zippered pocket for your important little things. The Gekko has a very safe braking action due to the low center of gravity and the long wheelbase. The standard disc brakes ensure maximum braking power even in bad weather. The front wheels are controlled separately so that you can selectively brake the inner wheel when cornering. Due to HP Velotechnik's sophisticated steering geometry, there is no effect on the steering when braking. On request, we mount mechanically or hydraulically coupled front brakes with one-hand operation and a V-brake on the rear wheel as a parking brake. After loosening the two clamping bolts at the frame bottom, the frame is set to your leg length by sliding the front boom in or out from the main frame. With the optional quick frame adjustment, the length can be adjusted more quickly. The chain length modification is compensated by smooth pulleys. By sliding in the front boom during transport, your Gekko is even more compact. The optional sturdy luggage rack is made of 10 mm tube and carries up to 25 kg. Your bags are held by the two-strut structure at a safe distance from the rear wheel. Practical detail: Integrated hoop guard for the rear light. When folding the rack remains fixed to the frame. Protects your clothes and the chain: The drive is virtually completely covered. The special chain guide tubes made of durable plastic ensure minimum friction and quiet operation. Protection against wind and weather: The optional Streamer front fairing from HP Velotechnik keeps your feet warm and legs dry. It can be easily removed via quick release lever and can be rolled up for transport. HP Velotechnik's optional Trikefender offers an excellent splash protection, especially on the side of the rider. Elegant, internal mounting with height adjustment for tires up to 50 mm (2"). 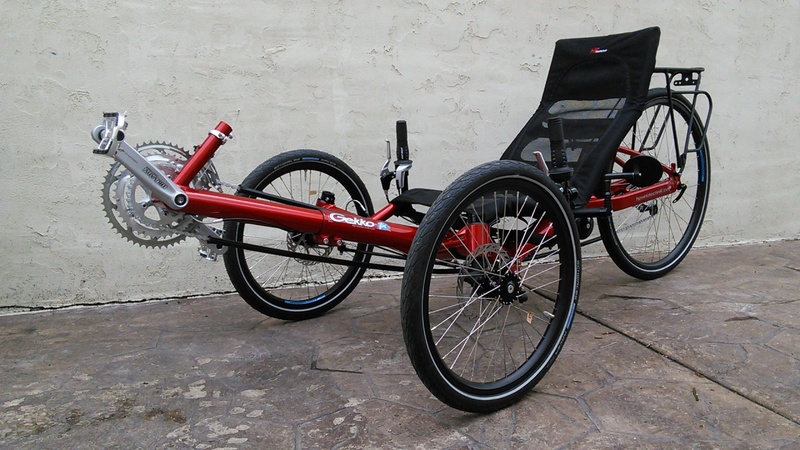 Optional Hand rest: a real increase in comfort for all trike drivers. The hands steer lightly without having to support the weights of the lower arm. The comfortably padded hand rests can be individually adjusted to all angles and inclinations. Also available with a possibility to fixate the lower arm � an ideal add-on for the one-hand operation of brakes and drivetrain.